I need some mults and passive attenuators in a 19" 1u panel. Is it only Metal Box making these ? Anyone in the UK making them ? Is there any advantage to using VCA's instead of passive attenuators ? You might also want to look at Ad Infinitum - I have a 19 inch multi from him and I think he does a number of other ultility items. I'm in the UK also but it wasn't a hassle for me. To answer your second question - you mean like the Blacet attenuator/ mults vs a VCA? there may be some audio colouration with some VCAs - e.g the MOTM 1190 VCA I think will give you a pleasing distortion. If you want to mix or distribute CVs (as opposed to simply attenuating them) then an active mixer or splitter is a better choice. A VCA adds voltage control of the level of course. You might also want to look at Ad Infinitum - I have a 19 inch multi from him and I think he does a number of other ultility items.. The closest things I saw on their site was the UM410 mults and UMM402 Mixer. I do like the UM410 but I only have a 19" 1u space left in my cabinet. I need the mults and attenuators in the same panel and I don't think I want attenuators linked to mults. Thanks. That's pretty much what I was wandering ? 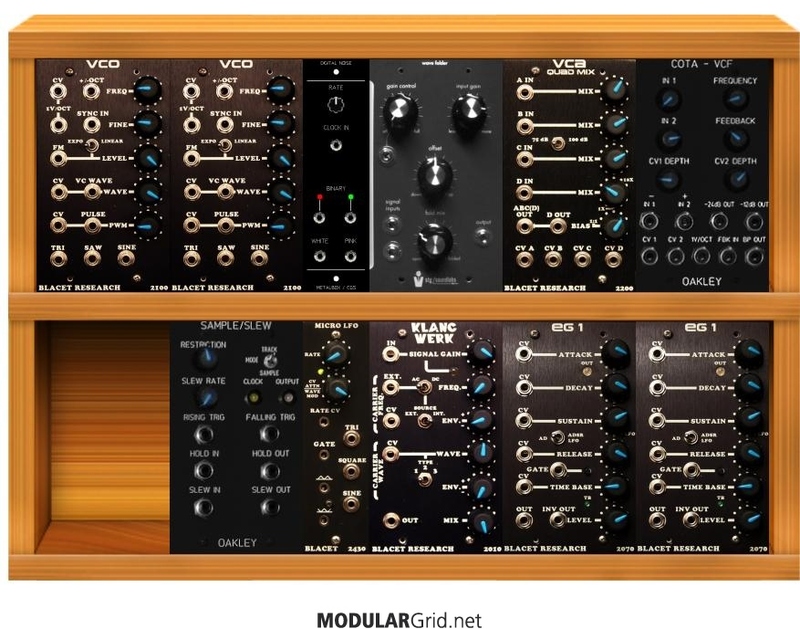 Well, I have 2 rows/12 modules of frac that do most of what I want but the only utility modules I have are a Blacet quad mix VCA and a Cirklon CVIO. I need to distribute envelope and LFO to multiple destinations more than I need to mix signals (for now,lol).and I need one or 2 signals attenuated after being split off. Maybe you could use a couple of these with some stackables? Those attenuating cables look great. I guess that frees up some space. I don't think stackables are suitable for me as my modular sits above an MPC and they'd be hanging over the screen. The past couple of days I've been thinking "What a doofus, imagine not leaving yourself enough space for some mixers"
So I've just ordered a couple of Blacet mixer/processors and will add another row to my case. Is the PAIA FR7 the cheapest way to add another 3u row ? Can the Tip Top Z rails (or similar) be used to hold Frac modules ? I'll end up with 9u of modules and a UM410 mults thingy..
My utility modules will be the UM410 mults, a 5 pack (or 2) of attenuating cables, 2 mix/proc's, Cirklon CVIO and the Blacet Quad mix. After reading the manual for the Blacet 3010 enough times for it's functions to finally sink in, now I'm thinking I should just go to a 12u case and stick six of them in , instead of getting attenuating cables and UM410 mults. Do any of yous prefer the Blacet 3010 or other Mult / Attenuator solutions ? As far as I understand it you can use the rails, but normally they are secured by end plates which you wouldn't be able to use due to the slightly different pitches of the mounting holes between frac & euro. So if you are going to mount the rails in your own case then they will probably work. But I've never tried to use them, that's just my understanding. There are some Eurorack rails by Schroff that don't have the lip. If you wanted to use Eurorack rails (with end pieces adjusted for Frac height spacing) then you would have to use ones without the lip. For horizontal screw spacing you would probably have to use square sliding vector nuts. I think it would be best to buy a blank ready made panel that has the flanges on the back to keep it rigid. you can expect the panel to flex when plugging things in. This does happen a bit with the ad-infintum panels unfortunately, but not a big deal. It was the same on the 19" Metalbox utility panels that I tried at a friend's house ages ago. I realize it's livable, but it put me off. I remember reading of a similar situation with the famed almost-sat on Milton Sequencer. IIRC Malekko Josh added some 90 degree steel bracket strips to stiffen it up. That dude knows how to make things rigid. Odd - I have an AdFinitum UM410 and it doesn't flex at all. If you look at 19" rack panels there are usually two types. One is cheap, thin aluminum and the other is solid, thick gauge steel. So that makes a big difference. If you have the aluminum ones they will need some sort of support to make them more rigid.